There’s lots of talk about how wearable technology will impact healthcare and revolutionize the industry. 4 Reasons Boomers Dont Use Wearable TechnologyThat’s great. But not so fast. The real people who need this technology are Baby Boomers–specifically the 60+ group who suffer from chronic diseases. And these folks should be the early adopters, but aren’t. Why? No one is training them on how to use the mobile technology. When I stop by booths at mhealth conventions and ask about their training efforts for the 50 + markets, I hear the same conversation. 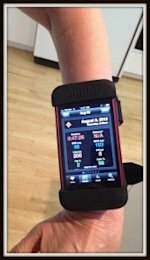 There are terrific health care and fitness devices on the market that could really help Boomer chronic disease sufferers, if only they knew how to use the device or app. I spend a good deal of time training this cohort on using mobile apps. At the conclusion of each session, I watch users become brand ambassadors, without even knowing it. 1. Apps and Devices are not intuitive for us. We didn’t grow up with these devices; they aren’t second nature to us. We push harder on the buttons to make them work and get frustrated when they don’t. 2. We want you to understand our dexterity issues and help us overcome them. We want to be taught how to use voice commands whenever possible. 3. We want to know WHY it’s important to use a particular app or health care device. Just because we’re used to using paper and pencil doesn’t mean we won’t or can’t adapt to new devices. But we need to understand why it’s important to do so, and how using the app or device will make our lives easier or give us more independence. 4. We don’t like to feel stupid. We want to have the latest and greatest apps and devices and we’re willing to pay for them when it comes to our health. But we want someone to teach us how to use them, preferably someone our own age who doesn’t talk fast and get frustrated.